The British perfume house Atkinsons 1799 recently launched Love in Idleness, one of three new fragrances recreated from the company's archives for its Legendary Collection. Love in Idleness is "a neo-Victorian love philter for those who believe in the magic of fragrance," developed by perfumer Fabrice Pellegrin. Its composition includes notes of raspberry and violet leaves; violet, orris and heliotrope; and tree moss and patchouli. This fragrance's name was one of the factors that lured me into trying it. So poetic, right? It's another name for the wildflower viola tricolor. And it turns out to be a literary reference, too — in Shakespeare's A Midsummer Night's Dream, love-in-idleness serves as a love potion. As Oberon, king of the fairies, says in Act II, "The juice of it on sleeping eyelids laid/Will make or man or woman madly dote/Upon the next live creature that it sees." Love at first sight! So, was this fragrance love at first sniff for me? Actually, it wasn't — that raspberry top note troubled me for a few seconds, especially on a paper blotter, where it smelled like a bright pink gumdrop. I was afraid that we were in for an English version of Guerlain French Kiss. Fortunately, that berry note is fleeting. It melts away and we're free to enjoy the fragrance's candied-violet heart, which reminded me of old-fashioned violet scents like Borsari Violetta di Parma. Love in Idleness is more than a violet soliflore, however: the heliotrope adds a lightly almondy note, and there's just a hint of greenness. Atkinsons promises a "seductive woody chypre" in the base. What we get is definitely a more streamlined, contemporary take on the chypre idea, which is fine with me; I actually can't wear full-bodied, old-school chypres. As Love-in-Idleness dries down, it turns powdery, thanks to the heliotrope and a very gentle musk. The violet note, remarkably, lasts throughout. I have no way of knowing how close this scent is to Atkinsons' 1922 original, but it does have a vintage sensibility. As you might already know, I'm very fond of violet-centered fragrances. Love in Idleness might just be one of my new favorites in this category: it's more complex than Annick Goutal La Violette, and more retro than Balanciaga Paris, but not a bombshell like Lipstick Rose. I found it easy to wear and enjoy in the daytime, although it might feel a bit too fluffy for hot weather. It also has excellent longevity for an Eau de Toilette. All in all, I thoroughly enjoyed Love in Idleness, from its concept to the actual experience of wearing it, and I'd recommend it to other lovers of nostalgic floral perfumes, especially violet scents. Atkinsons describes it well as "a shimmering, powdery violet cloud of a fragrance" — dreamy! 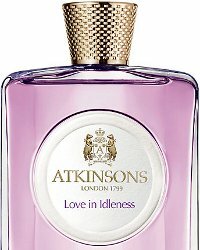 Atkinsons 1799 Love in Idleness is available as 100 ml ($210) Eau de Toilette. For purchasing information, see the listing for Atkinsons under Perfume Houses. Wow! This sounds right up my alley. Thanks for the nice review, Jessica! Oops, I meant to reply to meridifay here. I’m sure it’s not to *everyone’s* taste, but it’s certainly my kind of scent! I just wish they also offered smaller bottles. Elizabeth, you should give it a try, if you’re anywhere near Barneys in May! and thanks for that bit of literary history as a connection! I’ve been wanting to try many of the new Atkinson’s that they’ve released recently, but I must admit their prices seem WAY overpriced. Nonetheless, this one sounds lovely. Would you compare it at all to other violet/powdery/almond scents like…oh…Apres l’Ondee? Or L’Eau d’Hiver? The price is high, although not as high as some we’ve seen lately! I do wish a smaller bottle were available too. It’s more feminine and less innovative than L’Eau d’Hiver (more violet, less almond and other magical JCE notes) and it’s more candied violet than Apres l’Ondee EdT (and no wistful rainy-day violet-iris, but it’s much longer-lasting!). And, since someone HAS to ask…how does it compare to Misia? I’m embarrassed to say that I still haven’t tried Misia yet!! I’ve been avoiding the big department stores lately. I’ll try to make time for it this week! Yes, thanks for the review. I like reading about violet scents because my mother so loved Yardley’s April Violets, and for me that is the standard violet even though I know there is great variety in the genre. I don’t wear them myself other than a few spritzes of Paris occasionally, and Lipstick Rose even more occasionally. Annemarie, I do love the occasional spritz of Paris — the classic 80s rose-violet!! Wowee. This one is much easier for me to pull off, even in multiple spritzes. Thank you for the lovely review. I was not going out of my way to try this, because I ordered two Atkinsons samples (partly because of the names) at some point and was not impressed. But this seems so nice – a more complex La Violette sounds exactly like my thing. Does it have any similarity to Jolie Madame (love) or SL Bois de Violette? Hi, Petunia! This one doesn’t have the depth or darkness of JM or BdV — no leather, no dried fruit, etc. I admire both of those fragrances very much, but this one definitely falls more into the pretty-and-soft category of violets! What a nice review! I love violet scents and tend to enjoy heliotrope, I should hunt down a sample. This sounds wonderfully old-fashioned and romantic! Parley, I always have space in my “collection” for another old-fashioned, romantic floral fragrance…sigh! This *does* sound nice. A little pricey, but nice. I agree on both counts!